Posted on December 27, 2017 at 9:51 am. Christmas is over, but Casino-Mate wants to help you count down the remaining days of the year with bonus gifts to unwrap. 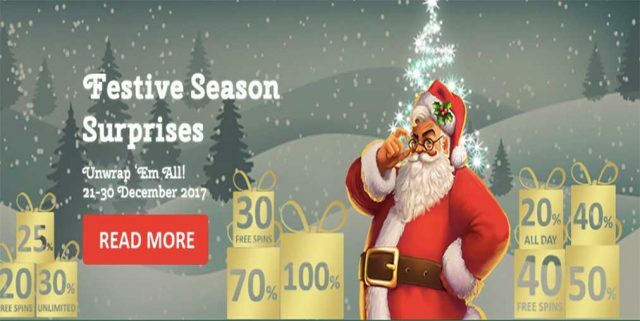 The online casino knows that the period between Christmas and New Years can be a bit of a lull, so it has put on its 10 days of Christmas between December 21 and December 30 at 23:59 UTC. You can find Crystal Queen and Sticky Bandits under the ‘Top 12’ games category, while you can locate Christmas Carol by using the search bar. You can also scroll through the available games under the Video Slots category, with these games the best to play when clearing the wagering requirements. Casino-Mate requires players to turnover any promotional bonus 40 times unless it’s the welcome offer ($1400 plus 80 zero wager spins), or a match deposit bonus of more than 100 percent in which case should be wagered 50 times. The online casino also has a cap on winnings of $/€200, but if you score the uncapped winnings bonus you will get to keep the excess. You will find one surprise bonus in your account every day, so be sure to register your details as soon as possible to claim as many as you can. You will need to deposit a minimum of $20 to claim a bonus, which you can do via the cashier with Visa and MasterCard, as well as bank transfers available. You can only claim one bonus per day, and the maximum bonus amounts are displayed above. Spoil yourself this with bonuses at Casino-Mate and get playing your favourite games to keep that holiday boredom at bay.